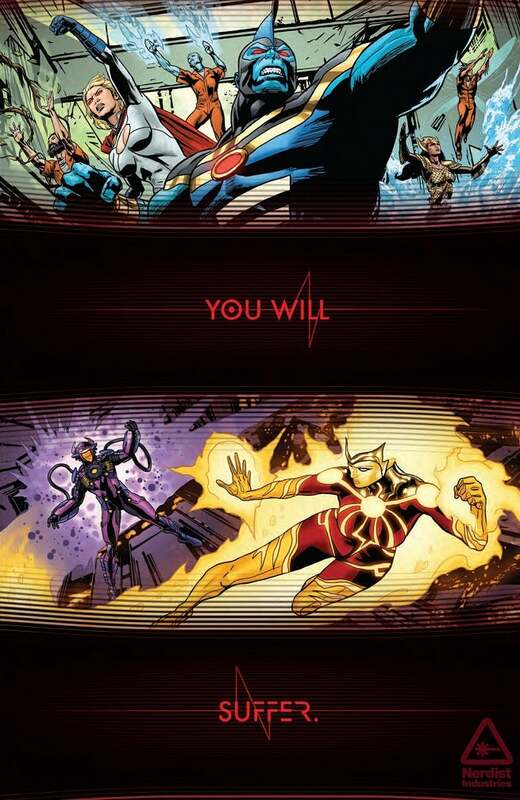 Last night, DC Entertainment gave Nerdist a first look at a series of posters in support of The New 52: Futures End, teasing the Five Years Later fates of Superman, Batman and more...in a way that seems to tie together with the expected Crisis-level story featuring Blood Moon Brainiac. 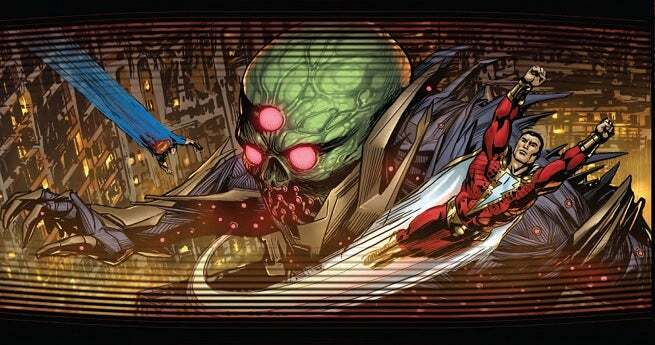 We get a visual here of Blood Moon Brainiac as a monolith, moving through a city like King Kong or Godzilla. Is that wreckage something he caused? More likely than not. In any event, it's not clear from this what his exact objective is. 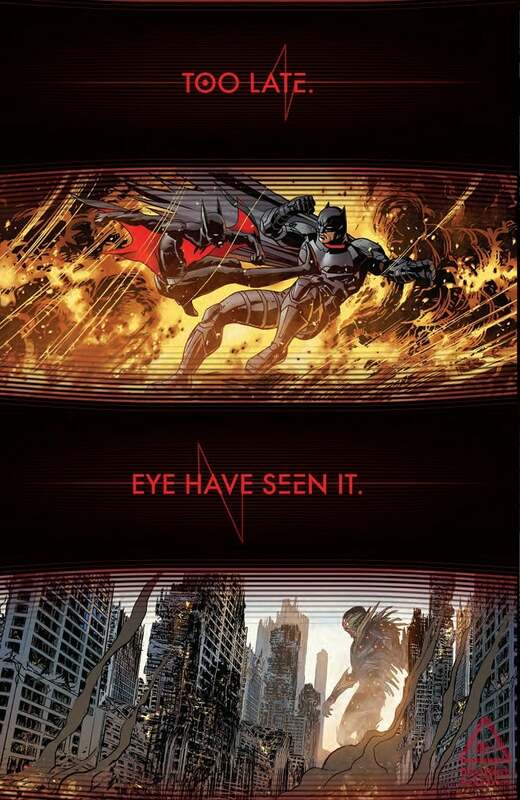 Above, we get Batman Beyond fighting with Batman...not all that surprising, given some of what we see further on; it seems Batman will be a key part of the next bit of story here. We're getting lots of alternate versions of characters. 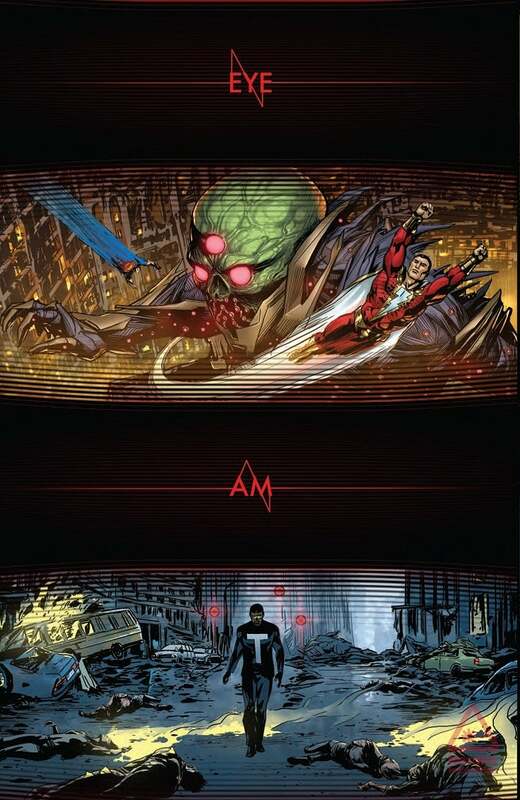 Are all of these from throughout the Multiverse? I don't remember enough of the first year or so of The Fury of Firestorm the Nuclear Men to remember whether this woman at the bottom is new or not. 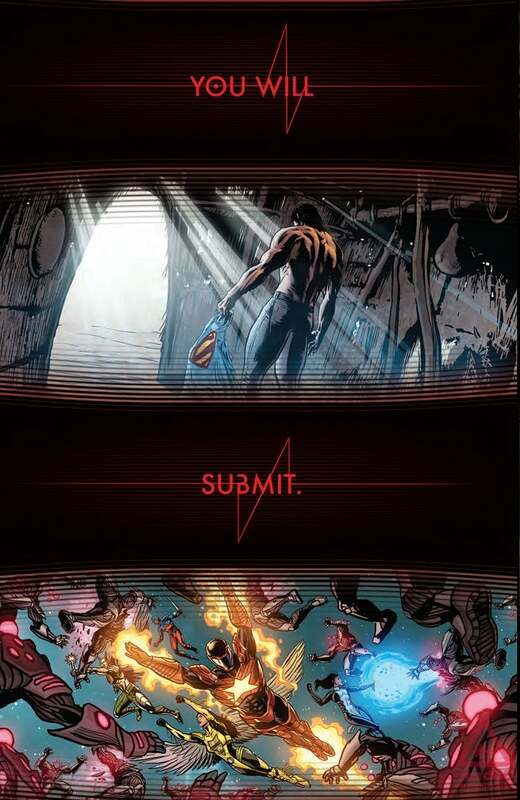 Here, we see our first glimpse of something that was hinted at on the cover of The New 52: Futures End #25: That's a bearded Superman, wearing jeans and carrying his Superman t-shirt. Presumably, this is after he comes back from whatever mysterious mission he went on in the Five Years Later future and never cameback from. Living simply in a hut, though: has he been gone all this time, or did whatever he did change him in such a way that he had to disconnect from society for a while, a la Kingdom Come? Either one could be true; in Superman: Futures End #1, he did tell Billy Batson that what he had to do in order to stop the war made him sick. At bottom, we see a group of Legionnaires. Obviously, we haven't seen these guys in canon since their series ended and our current 30th Century title, Justice League 3000, is set on an Earth that isn't the world of the New 52. This one's...pretty creepy and self-explanatory. Here, we see "t-shirt Superman" and Shazam teaming up to battle Blood Moon Brainiac. 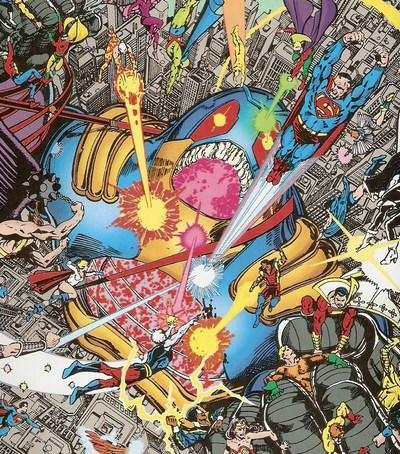 It can't be a coincidence that this looks somewhat similar to a famous image of the final battle with the Anti-Monitor in Crisis on Infinite Earths, can it? Just the way Earth 2 Superman's motion lines in the battle with a massive foe...I don't know, it's what I thought of first, and given the connotations of this story, ti seems hard to believe it's a coincidence. We also get a look at Mr. Terrific surveying the damage his Brother Eye satellite has wrought, something that's been building throughout Futures End. It's impossible to tell for sure because of the extreme close-up whether that's Terry McGinnis or someone else, but it looks too young to be Five Years Later Bruce (the logo also looks more Batman Beyond-ish to me), and the fact that Tim Drake is holding onto a Batman cowl at the end seems to suggest that he may get back into action in the way he least wanted or expected. Who kills a Batman? And what will Tim Drake do going forward? 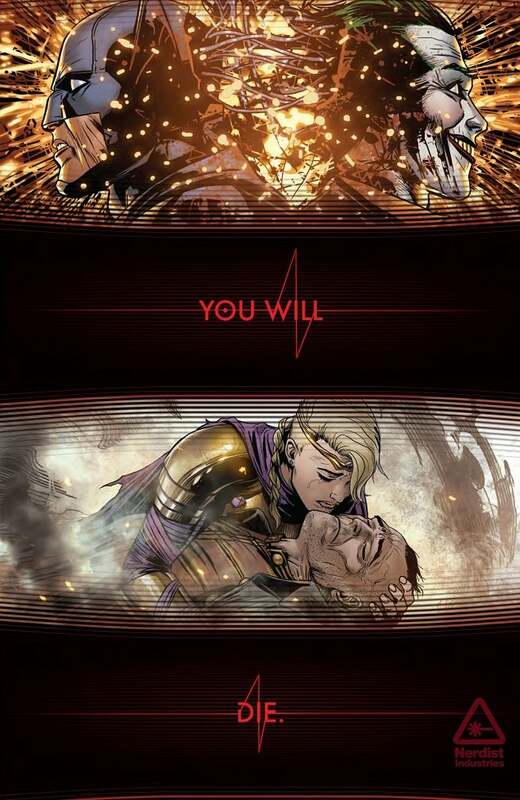 A general observation is that the text here seems to indicate (from font, coloring and language) that Blood Moon Brainiac and Brother Eye are connected. Given the "moon base" connection between the two, that's arguably not surprising, but these teasers seem to be the first specific indication. 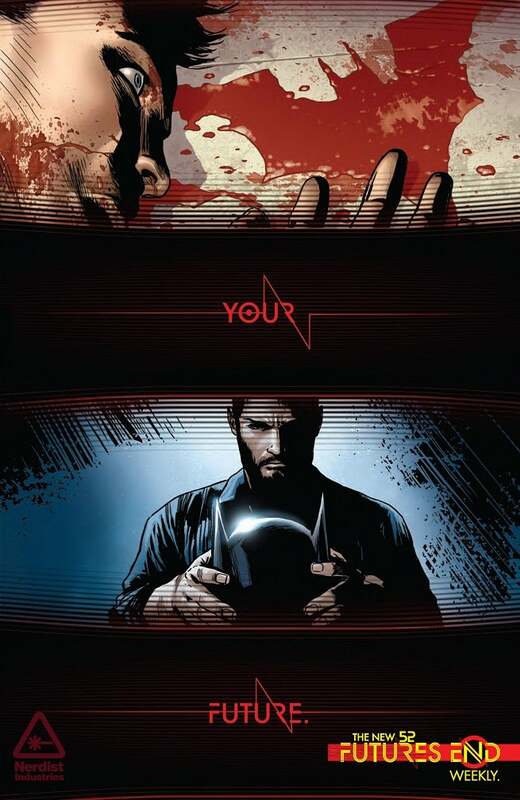 The New 52: Futures End continues tomorrow.